After a massive FaceTime bug that allowed users to potentially listen in on others when using the Group feature surfaced Monday, Apple disabled Group FaceTime in a short-term fix to the problem. An update to address the problem was expected this week, but Apple said Friday that while it has fixed the issue on its servers, we won’t see an update to re-enable Group FaceTime until next week. Grant Thompson, 14, reportedly learned of the bug accidentally while trying to start a Group FaceTime with two friends. When swiping up to connect with a second friend before the first one had answered, he discovered he was then instantly connected to the first friend’s phone even though they had not answered the call. The teen flagged the issue to his mother Michele Thompson, who told NBC News she then tried to escalate the glitch to Apple through multiple channels including by email and phone, but said she wasn’t able to connect with anyone to address the issue. 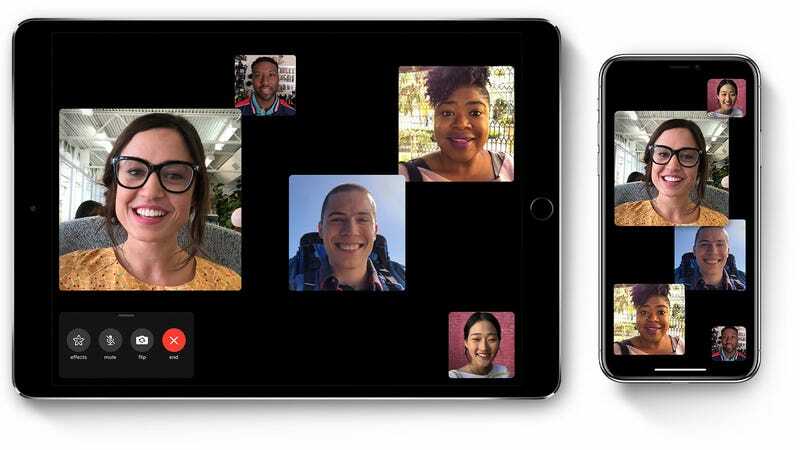 The bug could work on users whose devices supported Group FaceTime, which included those running iOS 12.1 and macOS Mojave 10.14.1 or later. Apple is already facing multiple lawsuits over the incident. Following news of the eavesdropping bug this week, New York Governor Andrew Cuomo issued a consumer alert about the bug, which he described as “an egregious breach of privacy that puts New Yorkers at risk.” Cuomo and Attorney General Letitia James later announced that New York state would be opening an investigation into the incident.